Tourist season is coming to an end and harvest season is in full swing - it is a perfect time to be exploring the Peloponnese and the nearby Saronic Islands. One of the highlights of our trip is experiencing olive harvest. Time and time again as we drove through the Peloponnese countryside Sunday we would come around a corner to find a mom-and-pop harvest underway. Large nets are draped beneath the trees to catch the olives. Branches were cut -- thus taking care of pruning and harvest at the same time, I guess -- and the branches shaken to release the olives onto the net. The olives were then stuffed into gunny sacks. We passed numerous old pickup trucks, laboring under the weight of stacks of sacked olives, as the harvest was taken to the cooperative processing plants that appear every so often in this area. We opened the windows to inhale the pungent citrus air as we drove through miles of orange groves. 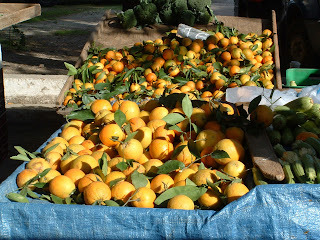 The abundant harvests of the area are reflected in the street markets held in towns and villages. The street market held each Wednesday and Saturday in Nafplion stretches for blocks as vendors display their fruits and vegetables. Zucchinis (courgettes) and aubergines (eggplants) carrots, cabbages and soft-ball-sized, vine-ripened red tomatoes are piled high. Leeks as long as yard sticks were piled like lumber next next to mountains of fava and string beans. Huge bags of perfectly-shaped potatoes were offered for less than a euro. In addition to oranges, pomegranites and figs, we were tempted by red- and green- grapes so vine-ripened they fell of their stems as I placed a large bunch into the bag the vendor held for me. Liter and half-gallon sized plastic bottles are filled with home-made rose and white wines. (We tried the white in a liter bottle - we paid 2E - it was an excellent sipping wine). Market prices are ridiculously low here; not like the prices we know at Farmer's Markets back home. We strolled through the Nafplio market, restricting our purchases to an item or two that we would eat during our short time there. And then we begin daydreaming. . . if we were to live here a month or two each year, just think of the wonderful things we could cook at home and how inexpensively we could eat. . . It was an idea as tempting as the produce!